When you are in the Isle of Spice, you should not miss the opportunity to visit our sister islands, Carriacou and Petite Martinique. 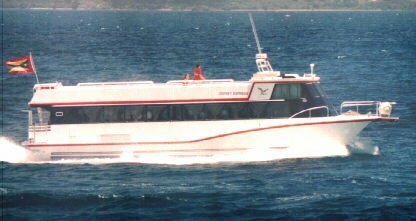 The best, cheapest and fastest way to get there, is with the ferry service, Osprey Lines Ltd. The Osprey is a modern ferry, which departs from the Carenage in St. George's. You can enjoy a wonderful sightseeing ride along the west coast. The trip to Carriacou usually takes about 90 minutes and costs approximately $160EC return. Of course, if you should wish to visit all the islands in our tri island state, then the Osprey can also take you to Petit Martinique.